I'm about to return my router to the ISP, which means no more internets until I either get to Australia or scrounge some free hotspot during my trip (I think Singapore has it if memory serves) so I'll be signing off for a little while. 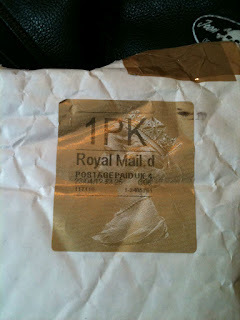 The GZG packet I ordered some time ago arrived this morning, just in the nick of time! This will give me something to paint if I get too antsy and buy new supplies before my 80 crates of stuff arrive in 40 days time. Likelihood: High. 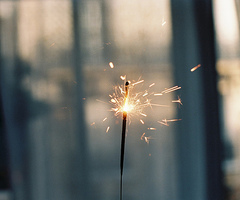 Thanks for all your support blogreaders, see you on the other side! So, I'm packing to move to Sydney from the UK. I've been here 7 years and had the best time of my life, but a fantastic new job is taking me back home. Naturally, the first thing I sorted out was my minis! 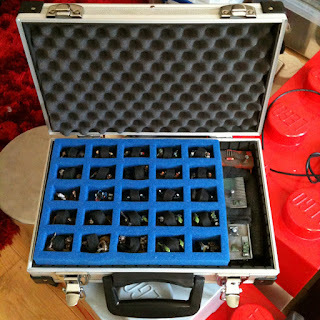 Above is my new mobile gaming case. 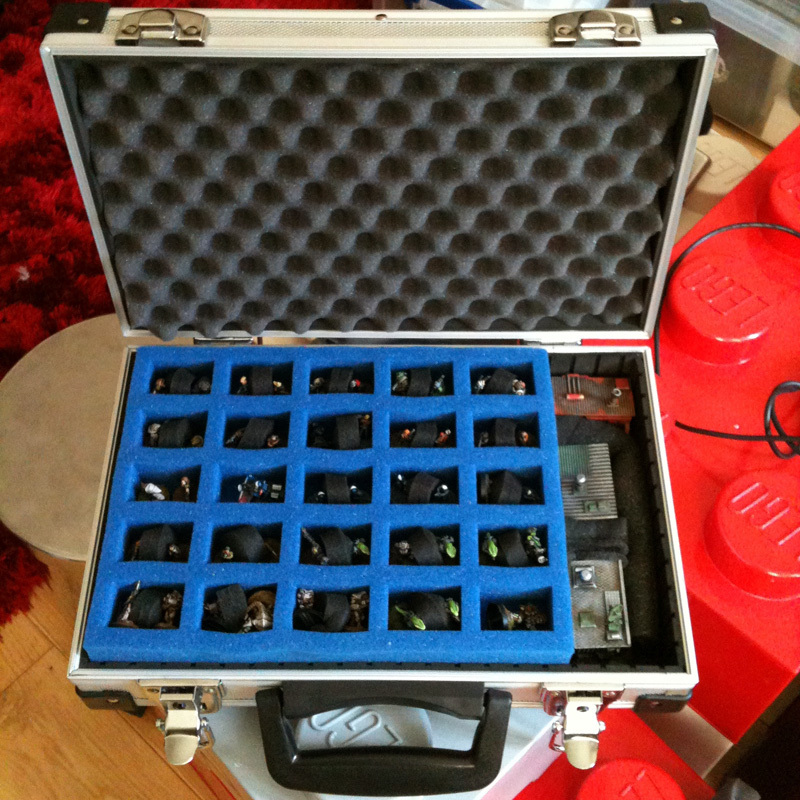 I managed to get a small range of minis and all my loose terrain into this case and packed into a 15cm Really Useful Box. Both fit in (and mostly constitute) my carry-on luggage. My personal effects, painting kit, hobby supplies and lead pile won't arrive on the steamer for another 6 weeks. Not to mention my gaming consoles... So for a month after I arrive, all I will have to do is play Throwdown with my travel kit and finish the rules! Hopefully by the time my stuff shows up I will have it about finished. 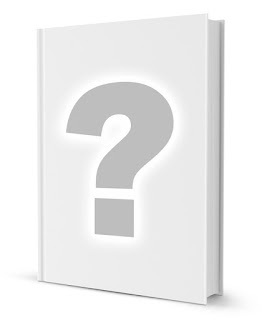 I will do another post regarding the release plan and what will be included. I've fortified myself with TV and movies for the flight, but I also have a plan to do some epic solo roleplay on my laptop. 27 hours is a long time! So now, more packing. I'll probably post now and then when I get the chance. 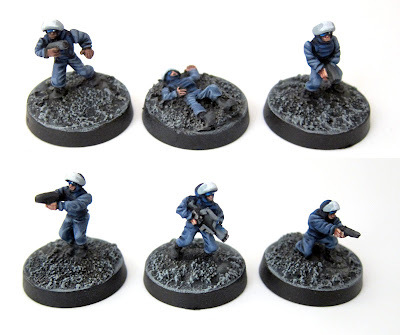 I ordered these from Khurasan a while ago, and loved them so much they shot to the front of the painting queue, right past the vac-suited exterminators... And that's saying something because those guys are cool. The more I think about my solo campaign setting the more the cops feature. As Throwdown games rarely feature more than 5 figures per side, these guys should be plenty for the moment. I am going to paint up the SEAL team as SWAT to back them up. I should add that these figures would be perfect for scenario objectives in pilot rescue missions with a military paint job. The fatigues are Citadel Shadow grey, the armor is Vallejo Prussia Blue. I painted the visors as solid VR headsets, as the figures have little goggles on under their helmets. Here is an Art Crime Productions jet-bike re-purposed into a Police Jet Cycle. I swapped the head off a spare security guard (I will put a GZG bare head on that mini) and added some Khurasan Stowage to the back, as I figured Police units would need first aid/riot gear and those little road cones etc. The bike has rectangular protrusions on the wings that made great Police lights. I really like how they look and I think they make the mini. While working on Throwdown (the working title of my ultra-fast playing solo miniatures rules) a couple of people have raised the question of PnP (Print n' play) vs a physical product. My intention was to go with the PDF download route. This is primarily because it means I don't have to deal with storing or mailing things, which I have little time or space to do. However, the more I think about it I understand there is a appeal to buying a product that you don't have to do any work to use and I've been investigating several ways I might get this done without storing hundreds of boxes in my garage (not that I have a garage at this point). The thing is, Throwdown is an entirely card driven system. If I bolt on my solo roleplaying/narrative campaign system, then there is also the possibility of having custom dice made for that also.. You would need 5-6 to play. Of course, you could just use normal d6 but having made some up, it's more fun IMO to use special dice if you have some. As I researched various ways of getting cards and dice manufactured, I started thinking about when I was playing TRWNN in November. I eliminated cards from the game by using chits because they were easier to "shuffle", an idea I cribbed from Too Fat Lardies, who sometimes use poker chips instead of card decks for this reason. What if instead of a deck of cards, you got a cloth bag of acrylic laser cut tokens that you drew out? The game would remain the same, but the tokens would be more durable than cards and you wouldn't need to shuffle them, just toss the tokens back in the bag and give it a shake. I did a huge list of pros and cons.. But I just deleted it from this post, because this isn't about what I think, it's about what you readers think. What are your thoughts and preferences either way? PDF print at home vs physical book, card deck vs bag of tokens... Please let me know in the comments below. I almost forgot these guys! They are GZG space pirates/bad guys. It wasn't until I painted them that I realized how cool they were. They are done in very basic colors to keep them both mook-like and usable in as many situations as possible. They coud easily be regular PC's rather than bad guys.. But I'll be using them for their intended purpose at first, as hero-fodder street toughs. There is a female in the set too, but she's so good I'm using her as a hero. I've switched back to white backgrounds you may have noticed. 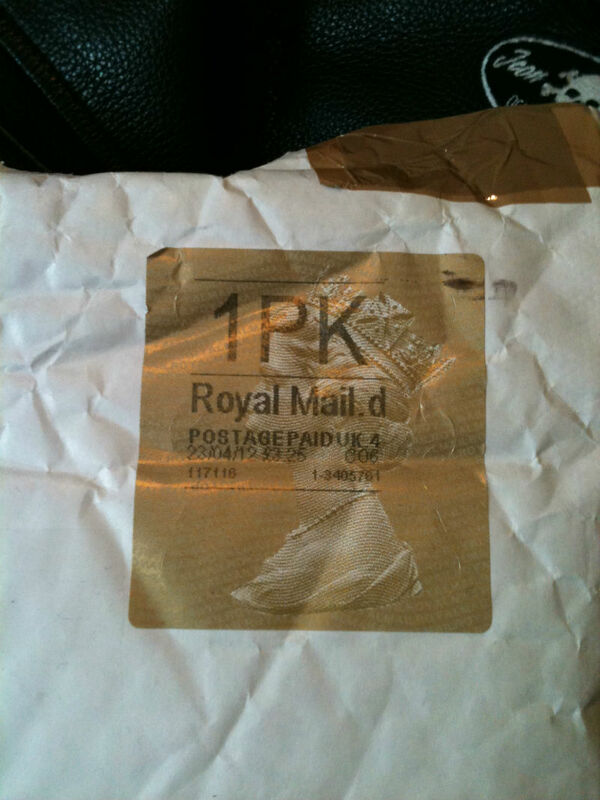 This is due to my camera behaving differently in various light conditions. Even using my light tent, on a sunny day it seems to like the white BG best. In the evening I think it overcompensates and blows everything out. I've been adjusting aperture manually lately with mixed results... But I think I'll just stick to not shooting at night if possible. Getting through my SHM range Aliens sculpted by Eli, we come to the Calamite Preacher. Another blue-skinned alien I just realized... I think I've done too many of these, but it suited his robes, which I did first. I just have the alien refugees left to paint from my batch of otherworldly denizens, but I'm going to base up the earlier releases from this range and keep at it. Yipes! I also have several 1/2 built terrain pieces that I fiddle with when waiting for stuff to dry. I'd like to thank everyone for the overwhelming response to the solo RPG post.. I think this shows it's something I should certainly develop further. I don't have anything I can show today, but I thought I'd do a post I've been meaning to get to for a long time. Who or what inspires my painting and modeling? The obvious answer (as an artist) is "everything". A good visual artist observes and breaks down pretty much everything in view all the time for future use... 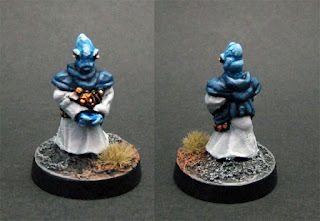 But to be more specific, what is behind my process as I paint a mini? As a young kid I learned to paint from White Dwarf Magazine. The work by the 'Eavy metal team seemed like unachievable goalpost, but I diligently read every article I could. 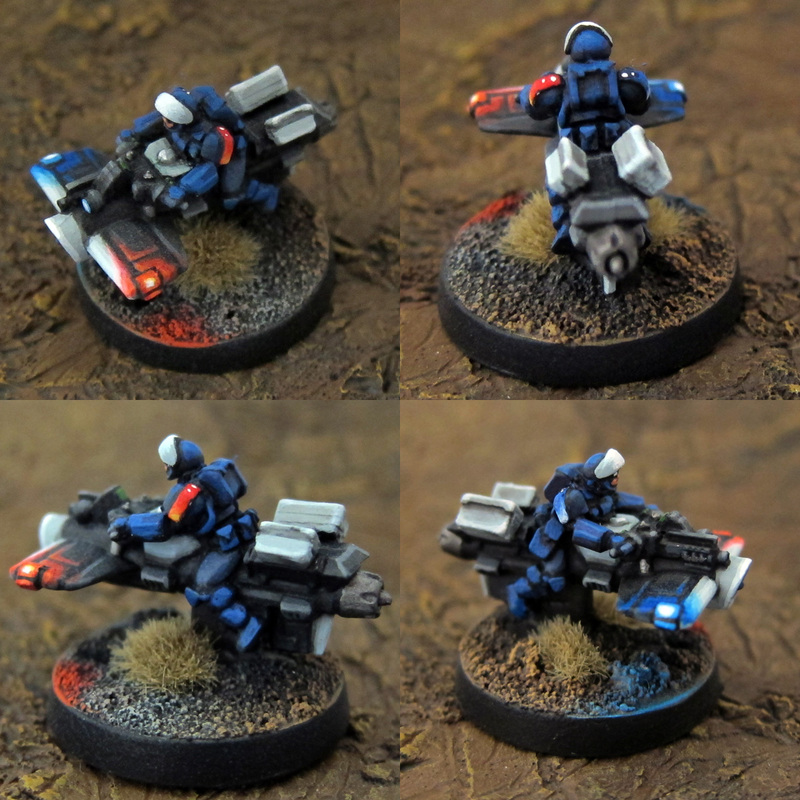 Back then I often settled on a color scheme or technique that I knew was only so-so, just the get the unit painted faster. I was always disappointed with the minis as a result and didn't enjoy using them as much. Nowdays I'm looking for new and fun ways to paint, rather than the fastest way to "get an army done". Army painting as a sole goal is actually a bad thing in my book. 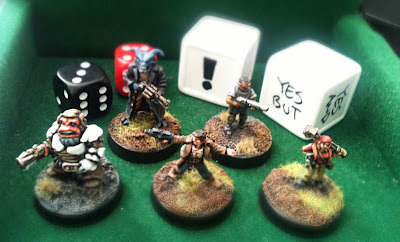 It is an artificial mindset that is at odds with the pleasure of collecting and painting miniatures, and instead encourages sacrificing effort in the name of getting "more troops on the table".. Which really equates to spending more money faster if you look at it from the company perspective. So with the demon of Army Completion firmly in my rear view mirror, I have discovered a whole world of fun by painting for it's own sake. Starting this blog has put me in contact via the internet with a great variety of painters and modelers, all of whom influence me on a daily basis. 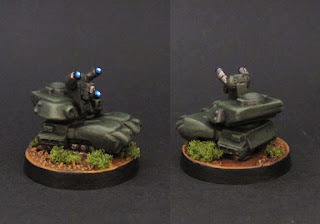 Of course I wouldn't have known about 15mm sci fi if it wasn't for Dropship Horizon. And chances are (if my Google stats don't lie) that you actually surfed here from that site. A great resource that continues to fuel the 15mm sci fi hobby in all regards. 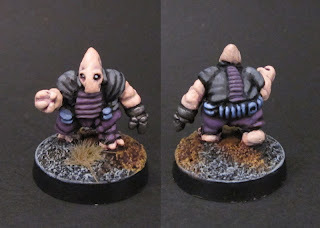 I'm sure you're no stranger to Gruntz, the excellent rules made by Robin Fitton. Robin and I have been in contact on and off since I started the blog, and I even sold him my original set of terrain to take to shows... If you've played Gruntz at a convention you may have even battled around it! The Gruntz site has tons of great tutorials and a fair bit of military modeling knowhow to boot. Does painting have to be laser-precise and perfectly blended? No! Mini painting can be warm and impressionistic and still look amazing. The work on Carmen's Fun Painty Time really changed the uptight way I thought about painting. 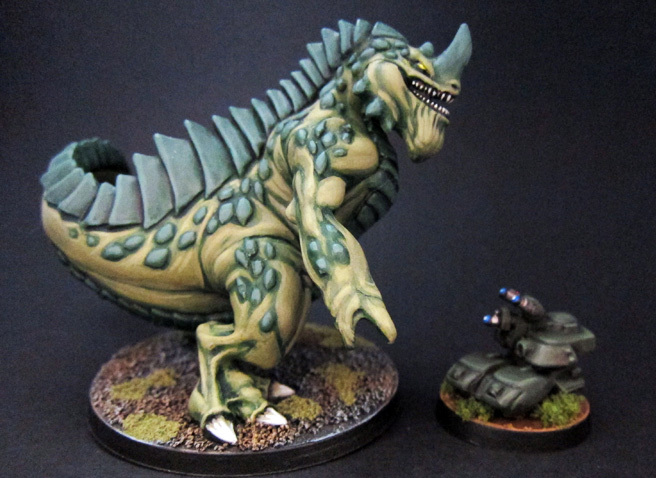 Mind you, can sci-fi miniatures be absolutely mind bending works of shading and detail? Absolutely yes if you take a gander at the guy who paints a lot of the the Infinity stuff: Studio Giraldez. And yes, this is where I got the idea to try OSL. Surely nobody does Infinity style models as well as 15mm sci fi? Yes they do, it's Fire Broadside. A treasure trove of inspirational painting here. When I'm in a bit of a rut, there's nothing like a broad spectrum cure, and Laughing Ferret Lab is about as broad spectrum as you can get. Clever conversions and a wide subject matter mean there's plenty to be inspired by on his site. Finally, you probably already know about Dave Taylor Miniatures. Dave is a flat out Hobby Celebrity and his site is always showing off his imagination and incredible industriousness. I haven't seen Dave in years, but we used to share a flat in Sydney that was completely filled with miniatures and paint. It's really heartwarming to see how incredibly far Dave has gone with his hobby career. This is not a "top 10" list or anything and I should stress again that EVERY blog I follow is inspirational to me, this short menu is just an example of the diversity that's out there and that there is no one best painting style or secret. I no longer have any interest in 40k, but that doesn't mean there isn't a wealth of information and great ideas from 40k hobbying that translate to my hobby on the internet. Thanks for reading, and enjoy your painting! 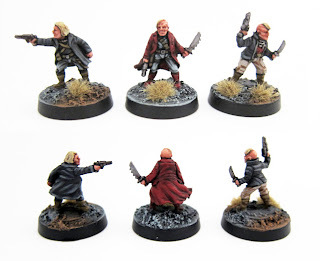 It has taken me this long to figure out that these 15mm.co.uk minis by Eli actually have names on the site. So here's the Kardul Bodyguard from that range. For his colors, I went along with the same ones I did for the crime boss, as he would be in his employ. The flesh is Vallejo basic skintone, which is very pale. I washed it with thinned purple ink to try to make it look alien, then highlighted it back up with very thin layers. His left hand was miscast, ending in a blob which confused me a bit at first. Putty to the rescue! I snipped off the rounded end and applied a blob of ProCreate , patting down the end to make a rough cylinder for the wrist. When cured, I stuck a blob on the end of that to make the spherical base of the hand. When this cured, I made four little sausage shapes and squished them onto the ball to make fingers. I did this while the putty was very freshly mixed so it was as sticky as possible. Using the edge of my home-made paddle shaped tool, I pressed the ends of the sausages on one at a time, making a knuckle out of the crease formed when sticking them on. A few little pats to get everything in line and that was it. Doing all this putty work has been extremely enjoyable lately, and I'm starting to catch myself actively looking to ways to convert figures. I didn't think 15mm conversions were possible at first, but you never know until you try. OK, this isn't 15mm scale. It's a Monpoc tank that I'll be using in my Mighty Monsters project.. Which also isn't 15mm scale. Would readers prefer I put this stuff on my 6mm blog (That I haven't updated in months) instead? Nevertheless, a fun little model to work away on while other minis are drying. I got a few vehicles with a giant robot mini as a set on ebay.. I think in the real game they morph together or something. In the Godzilla movies there are often high-tech tanks and aircraft that try to defend the earth from monsters with varying success. These vehicles are often armed with a Maser, which is .. I dunno.. A Monster Laser? Detail is soft and there was a thick layer of gloss paint on this guy, which means you need to highlight both aggressively and precisely.. But I think the model looks great when finished. Privateer Press really did an incredible job with this whole line. 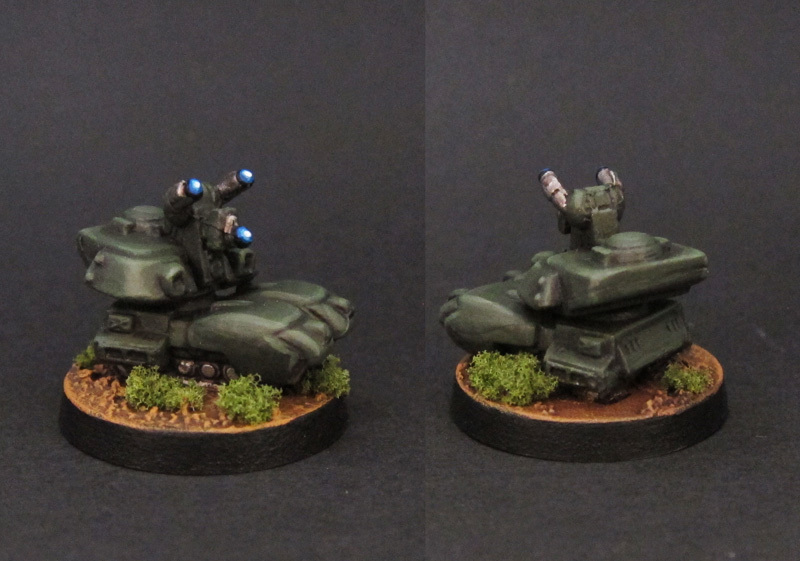 Here's the tank next to Terra Khan for scale. I was going to use 6mm scale infantry originally, as I bought 6mm scale buildings... But now I'm beginning to think 3mm stuff might look better. If there were 3mm troops and tanks in this shot the Maser tank would look huge and TK would be truly enormous! This mini is from Blue Moon Manufacturing. 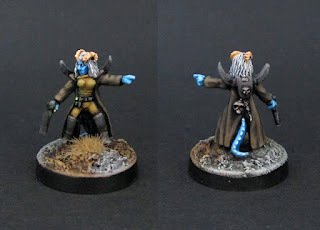 I've had a pack of them lying around for ages and now that I'm on a "Space Denizens" kick, I thought it was about time I painted a female alien. There are actually a few really good figures in the set for roleplay-ish use. The ammo carrier will make a terrific courier and there's a very nicely posed swords-woman as well. The skin and hair is kind of Andorian inspired, as my girlfriend has been obsessed with Star Trek Enterprise (The Scott Bakula one) and the Andorians are pretty cool in that show. I had more success with Charadon Granite this time, by lightening it with brown instead of white and glazing it with Gryphonne Sepia wash as a final touch. 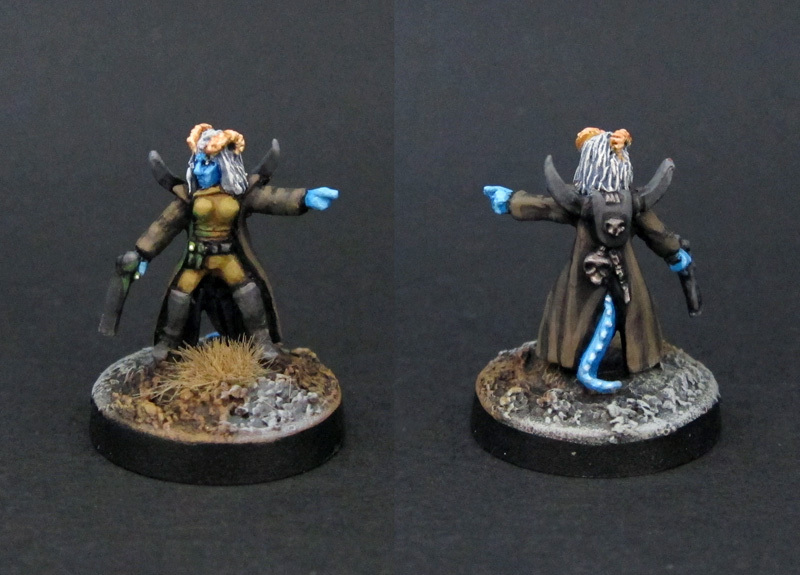 I threw in a little OSL on her belt doohickey and gun for my own amusement. It's a great way to add "tech" to a sci-fi mini as just about any old lump can be turned into a light source. In other news I have a batch of Khurasan stuff assembled and based that I need to do before any other personal work. I'd have done it already but I'm stuck on a color scheme. To add salt to the wound I'm itching to get started on the security troops and vac suited exterminators, not to mention my Mighty Monsters stuff.. but I must be strong.